Unless you are new to Texas Fly Caster, you already know the soft spot here for one of the hardest fighting southern freshwater fish – the hybrid or palmetto bass. I fielded text messages, e mails and phone calls through last month, all with one common theme; WHERE ARE THE HYBRIDS?!! I think it’s deeply documented through the history of Texas Fly Caster posts on hybrids, or as I believe they should be named “H Bombs,” that it takes certain circumstances to turn on the action in certain places off the deep lakes. It takes temperature, season and most critically – FLOW – to trigger H Bomb action in rivers and creeks. Their run up from Lewisville to the dam at Ray Roberts is especially dependent on flow as hybrids have a obstacle course to navigate, and it is only navigable with high water. Armed with the text that the “dam was open” earlier in the week, I managed to get over to my favorite fly fishing spot for hybrids, and was immediately schooled on what makes them so great. A vicious bite that nearly yanked the line out of my strip hand, and as I pulled tight the line sang out like a ukulele string, and this I don’t remember seeing; a mist trail behind the line as the fish ran for current. In this H Bomb’s case, resistance was not futile because I had not tied on one of my deep penetrating Tiemco Clousers, and after about a five minute tug-of-war, one last head shake and it was loose. I changed flies, and did manage to land one in the three to four pound range before I had to leave. Hybrid action is so furious that it still gives me a heck of a rush, and losing one is intensified by the rush. There was plenty of bait rolling by, dead and alive, so before I went back yesterday, I matched a new Clouser white/white on a killer hook – the only hook for hybrids – the Tiemco 600SP, and let it fly. I caught two of these youngsters, almost identical, before I had to do a research trip to the flats for carp midday. Feel free to ask if you would like more detail on catching these guys at the Ray Roberts Dam because believe me, there are more details. 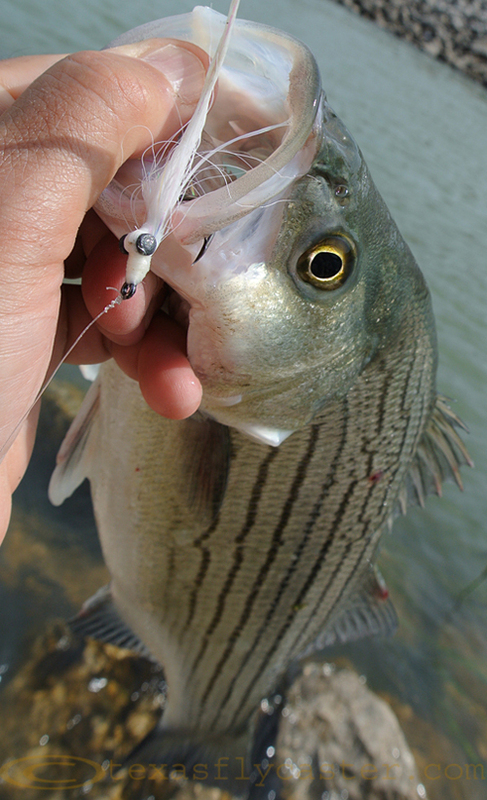 The Tiemco Clouser never let a single fish go, until I removed it from the two hybrid and two huge sand bass’ mouths. There isn’t much time left to get a shot at a creek running hybrid, and you don’t want to waste too much time trying to zero this one in. Time is now a factor for this bite as the stars begin to decline and the calendar is against it. It certainly doesn’t stack up to previous year’s runs of H Bombs, but one is better than none when it comes to these beasts!